THE JUNGLE TIGERS are not of course the "masters" of the jungle but only a very experienced band of German and Spanish musicians which has been touring the entire world for some years now giving extraordinary live shows in Germany, Great Britain, Japan and elsewhere! Their sound is lately focused on the wind instruments such as saxophone giving the band a new fresh breeze! Dig the fab cool cover-version of Ronnie Cook & The Gaylads' "Goo Goo Muck", the super groovy "Wildest Cat In Town", as well as the alternate "Tennessee Rock 'n' Roll". 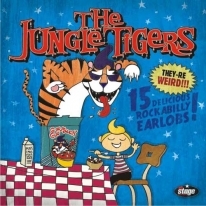 15 ultra cool nuggets by the best tigers of the modern rock 'n' roll jungle!